This policy (in place since 2004) is largely due to loud objections from some members of the Orthodox Jewish community. One community leader and Holocaust survivor, Charlotte Knobloch, has been paticularly active in ensuring the ban remains in place. She argues that Stolpersteine are a disrespectful memorial because they enable people to literally trample the memories of the dead. But many people—including Holocaust survivor Ernst Grube—disagree. Stolpersteine serve as a beautiful, dispersed memorial of the dead. Unlike a centralized monument, they’re something ordinary citizens encounter and think about during the course of their daily lives. And they are never installed against the wishes of victims’ surviving family members. 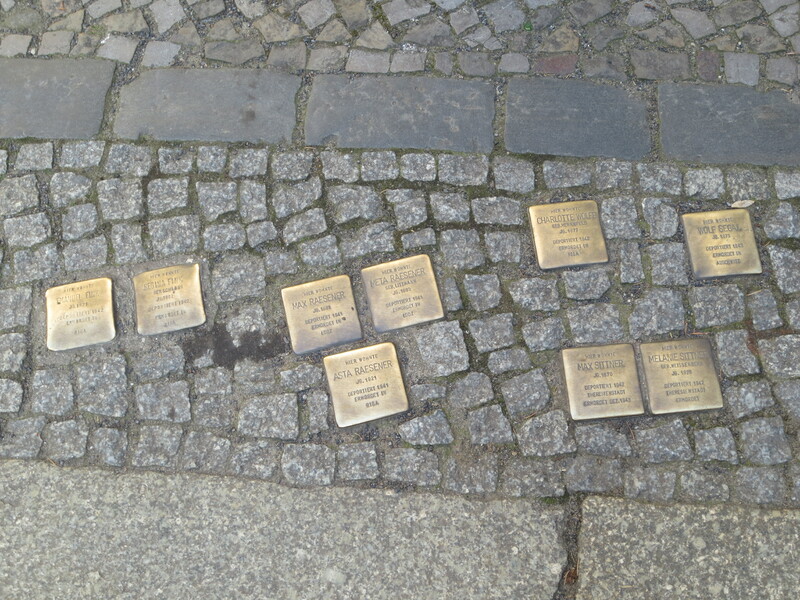 The initiative to get the ban on Stolpersteine lifted is led by Terry Swartzbeg, a member of my synagogue, and is publically supported by the Munich liberal Jewish community. I signed an online petition supporting the initiative, and so did over 80,000 other people, making it the most successful online petition in Munich history. Today at Königsplatz, Terry and Ernst spoke while scrolls with the names of everyone who signed the petition were rolled out. It was an impressive sight, and there was promising media presence at the event. I am sometimes skeptical of social media activism, but this is a cause where public opinion (and politicians’ perception of public opinion) matters hugely. If you think Stolpersteine in Munich are a good idea, please sign the petition and write a note explaining why. People from around the world had their personal stories and reasons for supporting this form of memorial read aloud today during the unrolling, and it was hugely powerful. Events like this will continue to take place until the ban is lifted, so more names and stories can only help. You can learn more, discover other ways to get involved, or contact the leaders of the initiative on this website.